I have grouped them into 4 main categories (1) Overall Tips (2) Diet-Related Tips (3) Exercise-Related Tips (4) Lifestyle-Related Tips. Enjoy! 1. Make a clear end goal. Have a clear goal in your mind. How many lbs are you planning to lose? How many lbs is your end weight? How will you look then? What will be your measurements? Very sharp, crisp and clear goals are needed to propel you forward. If you have ambiguous goals, you are going to get ambiguous results. The only way to be sure whether you are eating under or above quota is to track your calories. Use an excel sheet or a notebook to track it. Unless you track your calories, it’s going to result in guesswork on how much you are eating. You want to be as precise as possible to get the best results. For the whole of last year, I was tracking my calorie intake. It was also the year where I lost a good amount of weight – 13lbs! By tracking, I knew when it was okay for me to eat more and when I should stop eating for the day. Some days I did exceed my quota, and when that happened, I compensated by exercising on the day or eating lesser the next day. Conversely, if you find tracking too much of a hassle, you don’t have to track 24/7. Do it for a few days to get the hang of it, then keep a mental count every day as you have your meals. After doing calorie tracking for a long period of time, I’ve since developed a good sense of what are the high calorie and low calorie foods, and hence do not need to track my calories rigorously anymore. The key here is to be conscious of your food intake, and that you are consuming within or under your calorie output. 3. Detach yourself from how much you weigh. 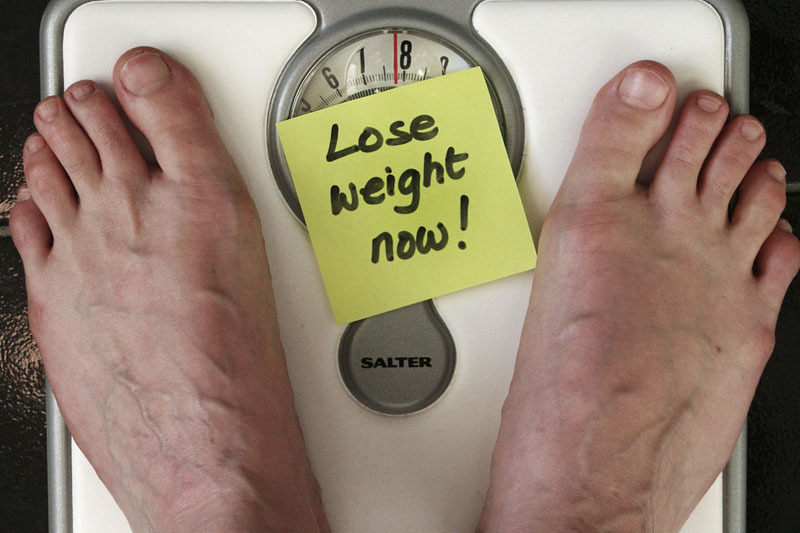 This is probably the one thing that thwarts many people in their weight loss plans. They keep weighing themselves every day to track their progress and become disheartened when their weight doesn’t decrease or increases instead. This was what threw me off on many weight loss attempts in the past. Detach yourself from your actual weight. Your weight is not a definite indicator of the success. Muscle weighs more than fats, so it’s entirely possible for you to weigh heavier after your weight loss regime, yet look skinnier. I have a friend who is overweight but actually looks very petite. She’s overweight due to the high amount of muscles in her body from her training as an athlete. Limit your weighing to just once/week or longer. There’s not going to be much loss in your body weight on a day to day basis to justify weighing it. In addition, our weight fluctuates quite wildly throughout the day due to water loss, so trying to weigh it every day might give you false indicators on your progress. Whatever plans you are planning for your weight loss, think in terms of long-term commitment. Every time you want to incorporate a new element to your program, such as low-carb, salad-only meals, exercising every day, ask yourself – Am I willing to do this forever? When you make radical changes, it will result in quick weight losses, which will be subsequently gained back after you revert to your regular dietary and lifestyle habits. This is why so many people report great benefits on crash diets or weight loss programs – only to gain all of them back and more afterward when they stop them. Typically they become heavier than before they tried to lose weight because their body is now operating on a lower BMR (Basal Metabolic Rate) compared to the past. The only times when your weight can stay permanently off is if you incorporate that habit as a permanent change into your lifestyle. If you aren’t willing to do that, then seek for a good compromise which balances your weight loss needs and your dietary needs. Whatever actions you take on are actions you need to commit for the rest of your life. 5. Get ready your dream outfit after you lose the weight. This is the outfit you are going to wear and showcase your new body after you achieve your target! 😀 The purpose of this is to motivate you toward your goal. It’s okay to buy a new outfit as a gift to yourself, but don’t get attached to the notion of consumption since it’s unhealthy. 6. Constantly remind yourself of your end goal. Over the course of your weight loss journey, there will be times when you feel like giving up or when you lose your originally motivation for losing weight. Make sure you keep the motivation running high. Keep your connection with your inner desires strong through external reminders – have posters of your desired end look around your room/computer/desk, immerse yourself in the contexts which got you to want to lose weight to begin with, hang your end goal outfit (Tip #5) in a prominent place in your room and more. 7. Eat based on your caloric needs and not how much food is before you. In the past, my eating behaviors were driven by external cues. For example, when I passed by an eatery or snack shop, I would be triggered into buying food. When my mom or dad arrived home with food, I would eat the food even if I may already have eaten before. While I was dining, if I had a larger serving than I could handle, I would try to finish it anyway simply because it was before me. I eventually realized eating based on external cues was illogical and was a big reason why my weight loss efforts were constantly thwarted. There was no need for me to buy food just because I was passing by a food shop. If I was hungry later on, I could easily find a food shop to buy food. By eating food when my parents bought them home, I was giving them the signal to keep buying food home the next time round. When I was dining, buying more food than I could consume was already a mistake; continuing to eat despite feeling full was an additional mistake! Whether I ate the food or discarded wouldn’t have made a difference – the learning should be reduce the amount of food I order the next time. After that, I ate based on my caloric needs and physical hunger cues, rather than what’s out there before me. It made me develop a healthier relationship with food. Read more about this in Step #1 of How to Stop Emotional Eating, Part 2: Rebuilding a Healthy Relationship with Food. 8. Plan your meals before hand. Plan your meals and food intake for the next day in advance, so you already know how many calories you are consuming for the day. For your meal appointments, plan the location in advance and be sure the location has the right food for your diet needs. Adhere to your plan – Only consume the food you have listed in your plan for the day. If you do deviate from the plan, you need to compensate via increasing your calorie output (exercising) or decreasing your calorie intake for the next day. Eating breakfast kickstarts your body to burn calories for the day. If you skip breakfast, your body will remain in the hibernation, low calorie burning mode induced during your sleep. 10. Eat small meals throughout the day. This keeps the calories intake spread out across the day. Taking in large meals means consuming more calories than your body can burn at the moment, which results in your body storing the excess calories as fats. It’s important to avoid that as it’s difficult to break down fats after they are formed since it is the last energy group which the body gets energy from. 11. Consume foods with low glycemic index. Glycemic index (GI) refers to the blood glucose levels in your body after you consume a food. Foods with high GI result in a high spike of glucose after consumption. This is unhealthy and contributes to diabetes in the long run. On the other hand, foods with low GI breakdown slowly after being digested and release glucose into the blood over time. Consuming foods with low GI (such as brown rise, wholemeal bread, etc) is better for weight loss. For more on GI and the GIs of different foods, visit Glycemic Index. 12. Get rid of high-fat food. Not only is the number of calories you consume important, the type of food you eat matters as well. In addition to the GI of the food (see Tip #11 above), reduce your intake of high-fat food. Our body needs about minimum of 10~15% fat in our diet in order to function optimally – majority of diets today easily exceed over 40% fat content. Cut out the oily, fried food – not only is it unhealthy, it makes your metabolism sluggish as well. 13. Stay away from your trigger foods. Do you have any trigger foods? If you have trigger foods, cut them off your diet. Trigger foods are foods which cause you to go into binging frenzies after you start eating them. These are usually foods with high sugar content, such as confectionery and candies. 15. Don’t drink diet sodas (or sodas for that matter). Diet sodas may be zero calories, but they make you more inclined to eat more after drinking it (see Reason # 1 in the article). One possible explanation is the artificial sugar confuses your body and makes it carve for real sugar instead. Check out 5 Reasons To Quit Drinking Soda Drinks (And How to Do It) for more on why you should quit drinking soda (if you are drinking now). This article hit the front page of Digg.com in March, drawing in over 45K unique visitors in 2 days and received 1400 Diggs! 16. Keep a regular exercise regime. Weight loss is a function of calorie intake and calorie burning. Adding exercise into your regime will enable faster weight loss. For me, I exercise at least 3 times a week, for at least 30 minutes each time. If you are thinking you are too busy to exercise, ask yourself if weight loss is a goal 30 minutes of your time. 17. …And stick with it. Many people plan an exercise regime, then deprioritize it at the last minute in the face of work or other reasons. It is your onus to make sure you follow-through on the regime. Getting a partner and/or a trainer will help in following-through on your regime. For every exercise session you stick with, it will go a long way in keeping you trim and fit. There are two reasons for this. Firstly, calorie burning does not just occur during the session; it continues after the session due to increased BMR from your muscles. Secondly, sticking with your exercise routine puts you in the right mentality to continue on your weight loss goals. 18. Use High Intensity Interval Training (HIIT). HIIT is a form of training where you mix up high bouts of intense exercises with low bouts of intensity. Under this form of training, you burn the maximum amount of calories in the given amount of time, making your workout incredibly efficient. For more on HIIT, visit this weight loss forum link. 19. Vary your exercises and build muscles. Try to do exercises that engage and build muscles in different parts of the body. Resistance training is a good way to quickly tone up your body. The more muscles you have, the higher your BMR; the higher your BMR, the more calories you burn every day. The key is to build as much muscle as possible (not necessarily with bulk) so you are burning more calories even at your resting state. 20. Play team or partner sports which you enjoy. Pick group sports which you truly enjoy. When you do that, you become genuinely interested in playing your best in the game. You will also be in the face of competition from the other players in the game. These will spur you on to continue playing and push past your normal threshold levels even when you are tired. These result in increased level of work out and higher calories burnt compared to if you are just exercising by yourself. 21. Increase your activity level. Beyond exercising, opt for paths with higher activity level in your day to day life. For example, between taking a bus and walking a short distance, choose the latter. Between taking the lift and climbing a few flight of stairs, take the latter. The more activity you incorporate into your daily life, the more calories you are burning. 22. Throw out your bigger sized clothes. Throw out your bigger size clothes since you are not planning to wear them again. This gives you added incentive to lose the weight as there’s no path of return. 23. Wear clothes that fit just right or are a little smaller. On the same note from tip #22, wearing clothes that are just nice or a little smaller will constantly remind you that you need to lose weight. It also prevents you from overeating during meal times. If you are buying new clothes, buy the exact sizes or smaller ones. Be careful not to buy clothes that are too small or you might end up demotivating yourself when you can’t fit into them. Overly tight clothes are also not good for our body! Ensure you get enough sleep. Sleep loss can actually increase hunger and affect your body’s metabolism in a way that makes weight loss more difficult. Read more about this from this link. 25. Hang around like-minded people. Spend time with friends who have weight loss and/or fitness goals as well. Join weight loss communities in your area and/or online. Motivate each other on your weight loss goals to keep each other going. The effects of being part of a support group can be quite astounding. This article shared the physical steps to weight loss. If you have a poor relationship with food, be sure to check out my emotional eating serieswhere I share my past struggles with food and how I overcame them. Also, don’t miss Thin You, “Meet” Not-Thin You, where I write about the spiritual aspect of losing weight.